Anyway. Back to the I’m-not-in-Santa-Fe frittata. 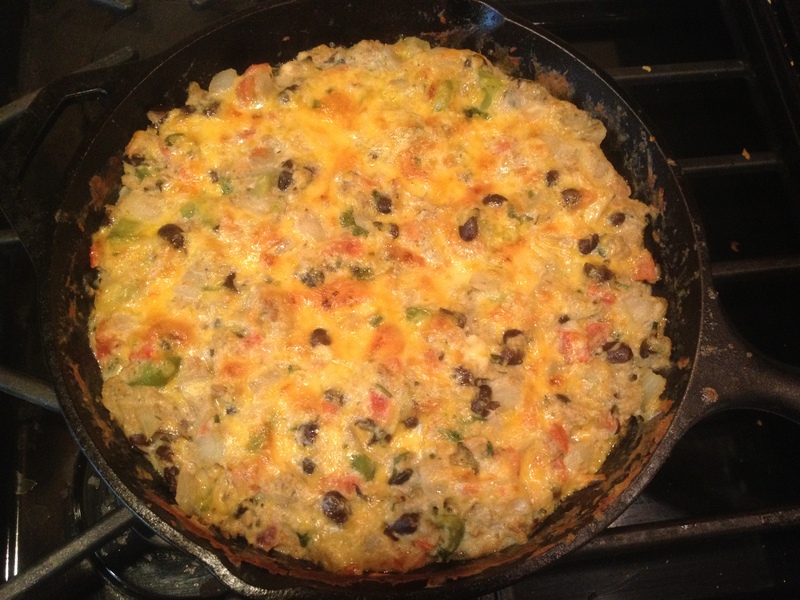 I knew that I wanted to make a thick frittata, packed full of vegetables and a big scoop of drained pico de gallo salsa. I was a little worried about getting my frittata to cook through, so I turned to the experts on nitpicky culinary concerns, Cook’s Illustrated. And, as usual, they had good advice for me: cook the eggs as if you are scrambling them until they are nearly set, then finish them under the broiler. Which I did. Southwestern Frittata with Peppers, Black Beans, and Cheddar: Saute a diced onion or two with a diced red pepper and a diced green pepper (include some chiles, of course, if you are lucky enough to be in the actual Southwest or have had a recent delivery). When soft, stir in a couple cups of drained black beans, and about a cup of drained pico de gallo or diced tomatoes. Season to taste with salt. Meanwhile, beat 6 eggs with a few Tbs. water and season with salt and pepper. (You could use a dairy product instead of water for creaminess; the water by itself just helps the eggs fluff up as it evaporates.) Mix the cooked veggies into the eggs along with a good handful of cheddar and some chopped cilantro. Wipe out and oil the pan you cooked the veggies in (I used a 10″ skillet), then scramble the eggs over medium heat until nearly set. Scatter another handful of cheese on top the the frittata and place under the broiler for a few carefully-watched moments to brown the top. Serve with avocado, salsa, sour cream, & cilantro. I love frittatas! I hope to be making one as soon as my oven is back in order!